The Open Data for Development Network (OD4D), during the recent International Open Data Conference (IODC 2016), announced that LDRI shall be the initial coordinator of the Africa Open Data Network. Consequently, we are now tasked with developing plans on how the network takes shape on the continent. The official announcement by OD4D can be found here. 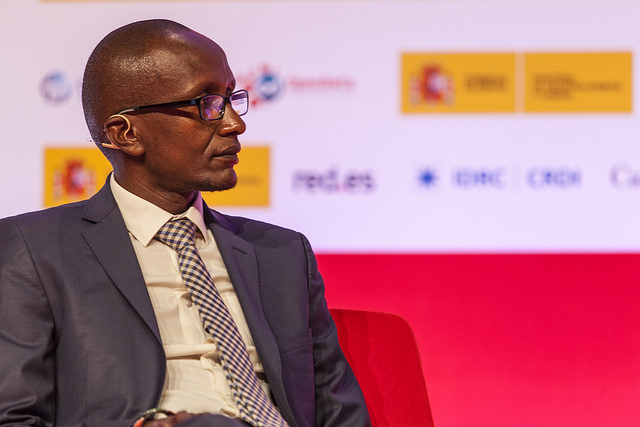 LDRI’s Muchiri Nyaggah at the 2016 International Open Data Conference in Madrid, Spain. Africa’s use of data and technology has been a source of inspiration for the rest of the world. Our vast community of technologists, entrepreneurs and governments have demonstrated great innovation. We have, as Africans, shown the potential that exists in harnessing the data revolution for development. Africa’s leadership in the statistics ecosystem has made the continent a leading light in this post-MDG era. For instance, the continent has established a normative framework for governance peace and security statistics. We have a significant amount of local knowledge and indigenous expertise that can be brought to bear in addressing Africa’s challenges. We are therefore excited about taking up this new role within a vibrant Africa-focused community of stakeholders. This is a community that subscribes to the pan-African vision of “an integrated, prosperous and peaceful Africa, driven by its own citizens and representing a dynamic force in the global arena”. We are a community determined to bring innovation, citizen engagement, entrepreneurship and sound science to Africa’s development agenda. For us, the role of open data in the achievement of Agenda 2063‘s goals and the SDGs is obvious. Making data and information available to all stakeholders is existential to people-centred development. It ensures the citizens of the continent can exercise their agency in the fight against hunger, poverty and inequality. LDRI is committed to African-led, inclusive, multi-stakeholder spaces that contribute to the emergence of developmental states in Africa. Because developmental states must act with authority, credibility, and legitimacy, they need to use evidence and make it available to all. Open data enables governments to publish this evidence in a way others can access, reuse and redistribute with ease. Therefore, an African Open Data Network is, in our view, a valuable addition to the continent’s development framework. It supports the African Charter on Human and People’s Rights and Article 3 of the African Charter on Statistics. Most importantly, a developmental state is one in which there’s access to information, civic space and freedom of expression. These are necessary for empowering citizens to contribute to their own governance. However, these same standards demanded from governments should be the bare minimum for civil society. Therefore, our networks must first be spaces where colleagues feel safe enough to participate and express themselves without fear of intimidation or victimization. Secondly, they should be spaces where information on the network’s activities and resources is openly accessible to all. Thirdly, they should be the kinds of spaces that support peer learning and healthy debate on how to address the issues affecting Africans. We are therefore grateful to the OD4D partners for their support in ensuring the Africa Open Data Network is African-led. We will ensure the plans for the network represent the voices and aspirations of Africans in the continent and in the diaspora. The Africa Open Data Network is for Africa and will be by Africans. Everyone’s welcome. We will not preside over the establishment of an elite club of organizations or individuals. Consequently, we shall soon be reaching out to invite input and scrutiny in our work. We look forward to co-creating the Africa Open Data Network with you. We certainly look forward to seeing growth and more cohesive collaboration in this space. Using data to better development and bring out transparency. Go Africa.